Low sodium vegetable juice is the secret ingredient in this easy-to-make bean salad featuring an assortment of canned beans, chopped peppers, onion and garlic. red bell pepper, chopped	 69 oz. 3 qt. onion, medium, chopped	 3 lb. 3 ea. 1. 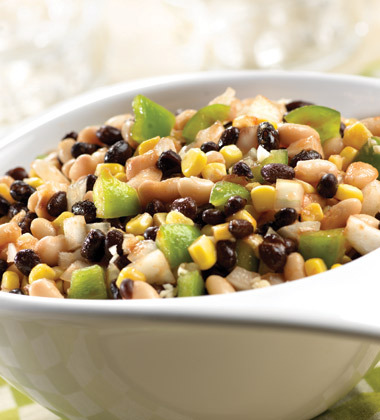 Stir the V8® Vegetable Juice, oil, garlic, black beans, white beans, corn, pepper and onion in a large bowl until evenly coated. Refrigerate for at least 2 hours. CCP: Refrigerate at 41 °F (5 °C) or lower. red bell pepper	 69 oz. 3 qt. onion	 3 lb. 3 ea. Serve with Grilled Picante BBQ Chicken and ½ cup of fresh cantaloupe for a meal under 500 calories. Also delicious with V8® 100% Vegetable Juice Low Sodium or V8® Vegetable Juice Essential Antioxidants.